The British Gazette » Vanity, vanity…… Thy name is? Err…… Cameron! Do not doubt it, Thursday 29th August 2013 was a historic day in the history of the UK but also in the history of France. It is painful to realise, but on this day, Frenchmen remember with Gallic pride the Battle of Grand Port. This is because it is one of the few naval battles the French have won against us! Grand Port was fought between squadrons of frigates. The battle was fought during 20th to 27th August 1810 over possession of the harbour of Grand Port on Isle de France (now Mauritius) during the Napoleonic Wars. Our squadron of four frigates sought to blockade the port to prevent its use by the French through the capture of the fortified Île de la Passe at its entrance. This position was seized by our landing party on 13th August, and when a French squadron under Captain Guy-Victor Duperré approached the bay nine days later our commander, Captain Samuel Pym, decided to lure them into coastal waters where his superior numbers could be brought to bear against the French ships. Four of the five French ships managed to break past our blockade, taking shelter in the protected anchorage, which was only accessible through a series of complicated reefs and sandbanks that were impassable without an experienced harbour pilot. When Pym ordered his frigates to attack the anchored French on 22nd and 23rd August, his ships became trapped in the narrow channels of the bay: two were irretrievably grounded; a third, outnumbered by the combined French squadron, was defeated; and a fourth was unable to close to within effective gun range. 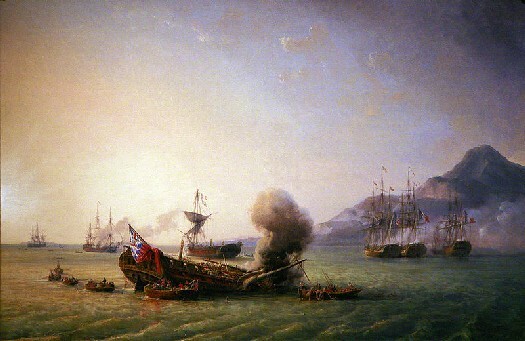 Although the French ships were also badly damaged, the battle was a disaster for us: one ship was captured after suffering irreparable damage, the grounded ships were set on fire to prevent their capture by French boarding parties and the remaining vessel was seized as it left the harbour by the main French squadron from Port Napoleon under Commodore Jacques Hamelin. This defeat was the worst the Royal Navy suffered during the entire war, and it left the Indian Ocean and its vital trade convoys exposed to attack from Hamelin’s frigates. In response, the Admiralty sought to reinforce the squadron on Île Bourbon under Josias Rowley by ordering all available ships to the region, but this piecemeal reinforcement resulted in a series of desperate actions as individual Royal Navy ships were attacked by the more powerful and confident French squadron. It was not until December 1810 that an adequate reinforcement could be collected, with the provision of a strong battle squadron under Admiral Albemarle Bertie that rapidly invaded and subdued Isle de France. - Firstly, we have been witness to “one of those moments” where the Constitution is further developed. Our Constitution is written, as British Gazette readers well know; the difference between ours and foreign constitutions is that ours is written in several documents whereas theirs is generally in one long one entitled “The Constitution.” The constitutional development of which we speak is the Royal Prerogative to wage war. This is now – in reality – a dead parrot. Never again will a British prime Minister feel able to use this power – now history – without seeking the sanction of the Commons. The British Gazette applauds this development. - Secondly, we have witnessed the French President François Hollande and US Secretary of State John Kerry move quickly to establish a common position prior to military action. Be in no doubt; this will have serious consequences for this country. British Gazette readers can be certain that François Hollande will seek to advance Frances interests as a result of recent developments. Chief amongst these is the French wish to see the European Union secure a Permanent Veto wielding seat on the Security Council of the United Nations. Such a development will have profound consequences as plans to expand the numbers of permanent seats the Security Council do not include giving these new permanent members a veto. The only way the EU could gain such a position is by taking one of the five seats already allocated. Of course the seats in question are those of Britain and France. It is axiomatic that were France to suggest that the UK quits [it’s status] the UK would suggest that France does and would use its veto to block any reform. It is therefore far more likely that France would suggest that both France and the UK should cease to be permanent members and that the two vacant seats are filled by the European Union and India. Do not underestimate the profound effects this would have on British politics. Retention of the UK’s “Great Power” status has been the motivation behind the acts of High Treason committed by Europhile politicians in the past. These men and women have sought to strut upon the world stage like their predecessors. However, whereas men such as Asquith were leaders of a Great Power, today’s incumbents are not. Were François Hollande to suggest this to Cameron, what could possibly cause Cameron to accept it? Answer: Real and genuine return of SOME powers from the EU to the Uk – on the basis that the UK looses influence at the European level in respect of these devolved competences. This would enable Cameron to offer actual meat to his party.